Look out… a 1980’s fad is rearing its head again. It’s called “hot desking.” According to the Oxford Dictionary, it is the practice of allocating desks to workers when they are required or on a rotating system, rather than giving each worker their own desk. Advocates of hot desking point out, it helps reduce overhead costs, decreases office footprints and provides flexibility as a company grows. 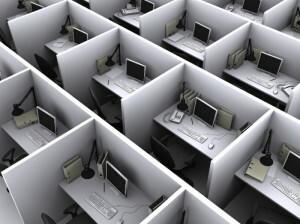 Opponents stress hot desking negatively impacts morale, reduces collaboration and eliminates personal spaces. Hot desking is the practice of allocating desks to workers when they are required or on a rotating system, rather than giving each worker their own desk. More than five years ago, the Institute of Work Psychology released a study that suggested hot desking made workers feel less connected to their team and may limit knowledge sharing across the company. As a communication professional, I find those results extremely troubling because it inhibits internal communication. Often called the “grapevine,” informal communication occurs everywhere, every day. While informal communication carries useful information, it also easily bypasses formal communication networks. Informal communication helps people feel a sense of belonging within an organization. Not many people know that informal communication comprises 70 percent of a company’s organizational communication. Specifically, informal communication provides an outlet for employees’ need to know what is actually going on within an organization. That is why, it’s critical to regularly know where your team members gather to talk about the latest buzz within the company. Or, being able to have a “hallway conversation” with the employees who influence internal communication is extremely important to top level leaders. If you don’t know where your employees will be sitting day-to-day or allow technology to limit team member interactions, the informal communication loop will be greatly impacted. Hot desking is controversial and it seems to pop up every decade or so. To determine whether hot desking is right for your company, just bring up the topic with a few influential employees who have their fingers on the organizational pulse. Then, watch how quickly this topic hits the grapevine. Chances are you will have an accurate assessment of your team members’ reactions on hot desking before the end of the day. Personally, I would take a robust informal communications network over hot desking any day. It’s hard to ignore the power of such a network on business strategies, corporate cultures and employee retention.